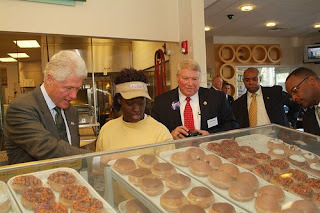 Where should Bill Clinton eat when he comes to Salem on Monday? 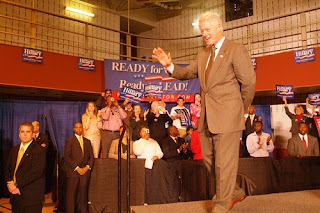 Former president and possible first husband Bill Clinton will be traveling through Oregon Sunday and Monday campaigning for his wife Hillary Clinton. 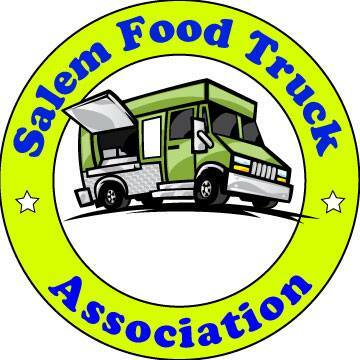 On Monday the president is expected to be in Salem although the details haven't been released yet. Hopefully he's hungry while he's here and he stops in a local restaurant for a bite to eat. If he does, where would you suggest that he go and eat? We know that the former "Commander in Chief" likes fast food and Salem has plenty of that. If he's downtown I'd suggest he head over to Court Street Dairy Lunch for a burger. If he's in NE, how about Willamette Noodle Company for a nice healthy plate of fresh pasta. In West Salem, Morton's Bistro. A piece of cake at Konditorei might be the thing to do in SE Salem. Let's keep him away from The Old Spaghetti Warehouse, Daynight Donuts, and either The Great Wall or Tin Tin Buffets. Where do they serve the best crow? Because that's what he and Hillary will be eating soon and he may want to scout out a good place. Man....he can come to my house. I'll fix him some dinner!!! I'll even let my husband hang around. I know, from other's comments, that Court Street Dairy Lunch is the preferred local burger spot, but sending the big guy to The Burger Basket just seems more appropriate to me. Please no Tin Tin! Didn't they just fail their health inspection? What an impression to leave him with! When Bill was leaving Chemeketa, I noticed he was sipping on a diet Coke. Anyone know what he had for lunch? Isn't he living in NY these days?